Century Cycles Blog: Bicycle Touring Season has begun! Yesterday's sunshine and warm temperatures made it a perfect day for a bike ride. Coincidentally, the day brought our first bicycle touring visitors of the season to the Peninsula store! 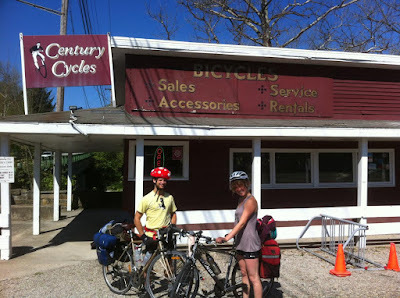 Alex and Shaina are from Massachusetts, and are riding "just for fun" to Shaina's home town of Athens, Ohio. All three Century Cycles stores get a lot of bike-touring visitors throughout the year, since they are on two major cross-country cycling routes established by the Adventure Cycling Association.The Medina and Peninsula stores are on the Underground Railroad Bicycle Route, and the Rocky River store is on the Northern Tier Route. For bike-touring folks who would like to stay off the roads, there are now several options for camping along the Ohio & Erie Canal Towpath Trail. You can see more pictures of bike-touring visitors of the past several years in our Bicycling Touring Photo Gallery. We support touring cyclists not only by being a Bike Shop Member of the Adventure Cycling Association, but by carrying and being knowledgeable about a wide range of bike-touring gear. We've got one of the most popular touring bikes in stock, the Surly Long Haul Trucker (as well as the NEW Trucker Disc! ), plus expedition-quality racks, bags, and panniers from Arkel, rain jackets and pants from Showers Pass, and more!